© 2013 by Nancy Butler; all rights reserved; content may not be copied, rewritten, or republished without written permission. There are varieties of insulation available on the market and you may to choose according to your needs. Fiberglass, foam insulation, cellulose, and even soy bean are a few to mention. They are all available in different R-values. The material the insulation is composed of also differs in its thickness and density. 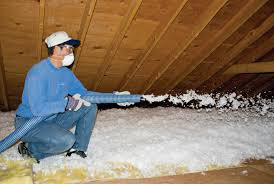 The most commonly used insulation which is usually found in the commercial and residential buildings is blanket insulation, rigid board insulation, spray foam insulation, and loose fill insulation. Whichever type you choose, remember to always wear your safety gear. This means a dust mask or respirator, safety glasses, gloves, and a baseball cap to keep particles off your face. To begin with, loose fill insulation is the most basic type and is made of loose fibers and fiber pellets that can easily fill in wall cavities or attics and is being used in special machines. They are expensive, but are considered to be an efficient method that can completely insulate the affected areas and also make it airtight. Of course, there are different types of loose fill insulation available. These are the most common types your contractor or handyman is likely to recommend: cellulose, fiberglass and a Rockwool mixture. In the category of green insulation, cellulose (recycled newspaper) is chemically treated in order to make it a fire resistant product and open and closed-cell soy-based insulation is an extremely sustainable building material. The fiberglass and the Rockwool mixture can be used in the blow-in blanket system that can give complete coverage and also efficient insulation. Blanket insulation that is also available that is made of mineral fibers available in blanket rolls of different widths. They are used to insulate the floor, walls, and ceilings and they can also be installed in between the wooden joists and rafters. They are affordable and easy to install in tight areas by making a tight roll, placing it at the beginning point, and then rolling it out using a push stick as an installation aid. Batts come in different dimensions. A couple of common widths are 2 for attics and 16 for walls. Both paper-faced and non-faced are available. For attic applications they can be rolled out. When insulating walls, it is best to use paper-faced. Why? Because batts tend to obey gravity and slump down over time. The faced variety have a paper flap on the edge that can be stapled to the studs to prevent this problem. Spray foam is applied using insulation blowers. The product is actually composed of two different liquids, commonly known as a polymer agent and a foaming agent. They are combined and sprayed into wall cavities or ceiling spaces. While applying the liquid foam and it begins to cure, it expands and turns into a solid plastic-like material. This may be an expensive solution (when you hire someone or rent the equipment) but it is very effective because it seals every crack and crevice. The cellulose insulation is made from the recycled ground-up newspaper. The material is treated with a flame retardant at the factory. It is then blown into attics with the help of a machine, usually a compressor. It is available loose-fill and not in the batt-form like fiberglass or cotton. Cellulose can actually be dusty and it is blown into applications that can settle nicely. Cellulose insulation derives its R-value from the thickness of the installation. The higher the R-value will determine the price of the job and this will influence your buying decision. Nancy is the professional writer. She takes joy offering an explanation of different forms of insulation machines that are currently available on the market.